It's all about proportions for me. I like 2 parts frosting to 1 part cake (and no, I didn't accidentally write that backwards). I like 3 times more chocolate chips in my cookies than what's called for in a typical recipe. When it comes to apple pie, there exists a perfect bite, consisting of 45% innards, 20% crust, and 35% vanilla ice cream. As far as cheesecake goes, I'm more a fan of the crust than the actual cake. That's one reason why this particular recipe appealed to me so much. Another reason is that it makes use of yogurt, which has come to be one of my staple refrigerated items. Of course I like to eat yogurt as a snack, either on its own or mixed with granola (17%) and fruit (23%), but I've recently come to appreciate it more as an ingredient in things like muffins and quick breads--it tends to add a moistness and flavor that buttermilk and sour cream can't seem to contribute. Right now, my yogurt of choice is Chobani. It's thick, it's natural, it's healthy, and the people behind it are passionate and dedicated to bringing us the best possible product. They make many flavors of both fat-free and low-fat Greek yogurt, and I've yet to be disappointed by any. The original recipe for this luscious caramel cheesecake called for sour cream, but on a whim, I used Chobani's plain 2% Greek yogurt instead. The resulting cake was so smooth and rich and decadent, I have no need to try it again with sour cream for the sake of comparison. When something this close to perfection is made, why mess with it? For me, the ratio of crust to filling is just right, especially since the crust is laden with toasted pecans. The cherry on top is the amazing caramel sauce that gets added at the end, assuming you have any left after taste-testing one time a few times repeatedly and without end. *This post is sponsored by Chobani. Wrap the bottom of a 9-inch springform pan with 3 or 4 layers of heavy-duty foil. To make the crust, combine ingredients and blend until a uniform dough is made. Spread to the edges of the pan. Prick all over with a fork, then bake 15 minutes at 400 degrees F. Allow to cool. 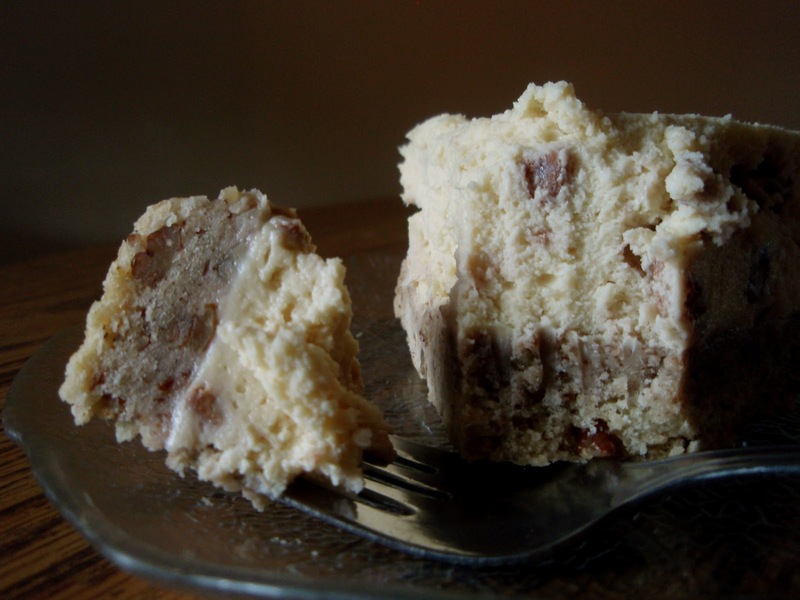 To make the cheesecake, beat cream cheese until smooth and fluffy; beat in brown sugar until light and well-blended. Slowly beat in the eggs, then the yogurt and vanilla. Beat just until well-blended. Pour into the prepared crust. Place the foil-wrapped pan in a large, shallow roasting pan. Place in the oven and add about 1/2 inch of hot water. Reduce heat to 325° and bake for 45 to 55 minutes, until the cheesecake is firm around edges but still slightly jiggly in the center. Turn oven off and leave the cheesecake in the oven for 30 minutes to an hour longer. Place the cheesecake on a rack to cool to room temperature. Remove the pan sides. To prepare the sauce, first heat the 5 tablespoons of butter and pecan pieces in a saucepan over medium heat. Cook, stirring, until the butter is lightly browned and pecans are aromatic. Add the brown sugar to the butter and cook, stirring, until the sugar is dissolved. Stir in the cream until thoroughly mixed. Your pictures always make me hungry! I completely agree with you on the proportion thing. For example, when I make my key lime pie, I double the graham cracker crust. I love that this cheesecake has such a thick crust like that - especially when it sounds so buttery and delish. We also like Chobani in this house...or Fage is good, too. Last time I made lasagna I added some greek yogurt to the ricotta and it was so nice and creamy - I will do that from now on, too. What a great concept to use it in your cheesecake - I bet this is super creamy. Hmmm, I see you have given much though to the ratios Grace. I do agree with you on the frosting/cake ratio but I do prefer more goo to crust in cheesecake :) I LOVE greek yoghurt and frequently substitute with it when a recipe calls for sour cream. I usually have yoghurt on hand but not the cream. mmm, gotta try the crust with pecans, sounds right up my alley. Too funny about the ratios! I'm a fan of the crust on cheesecake, too. Love that this uses yogurt! I agree! Your photos of this cheesecake are captivating. I can't take my eyes off that crust. I'm a buttermilk fan when it comes to baking, but I'll try adding some yogurt next time, thanks for the tip. This looks so good. I want to make this. I will add to the top- some warmed apples and cinnamon... hmmmm. I swear to God we were separated at birth. I agree with every word--now I want this cheesecake! Toasted pecans in cheesecake crust is the best way to go! This looks amazing, Grace, and I love that thick crust...I'm imagining a soft, almost sugar cookie-like bottom. Wow! I don't love cake frostings, but I love my dessert topped with ice cream ;)That looks absolutely delicious!Your pictures make me hungry! My personal favorite is 60% crumb topping to 40% whatever it goes on top of. Nice post! Clearly you're my sister from another mister. "informative" never looked so delicious! Oh, this just looks wonderfully decadent.......I've most certainly got to try this, I'm certain the family will love it! Thanks for the share!!! That looks lovely! Although for me cheesecake is all about the filling - I can do without the crust completely! That looks just about perfect to me too - I'll be putting that into the try it file. Thank you! Geez Grace. You had to get me craving cheesecake before 8am. After seeing that mouthwatering picture I have to agree with you. I can't imagine ever using sour cream again! So you and are probably alike in that if there is a cake with giant frosting flowers, we NEED to have that piece, right? and if a sheet cake, we don't settle for anything other than a corner, correct? I agree with all your proportion preferences! Esp the cheesecake one. I'm not actually a huge cheesecake fan but I always enjoy the crust and wish there were more of it! I must admit that I often like the cake better than the icing. Not that I don't like icing, but unless it's great, I probably won't bother. If it's great, there's no stopping me! A while back I made a fig tart. I confess I ate the crust and the filling first...forget the figs. Last week I did those pumpkin thingys in a jar and all I wanted was the gingersnap crust. And if the crust has pecans in it? Forget the rest of the pie! So you are preaching to the choir here, my dear. Love your proportions! The cheesecake looks pretty tasty too. I agree, more frosting than cake- if the frosting is good, more crust than goo, more chips than cookie. I think we are related! o boy..the cheesecake looks divine! I love the thick crust. Haha well you see that's why I like you Grace. I didn't blink an eyelid when you said 2 parts frosting to one part cake! You and i have eerily similar ratio preferences. 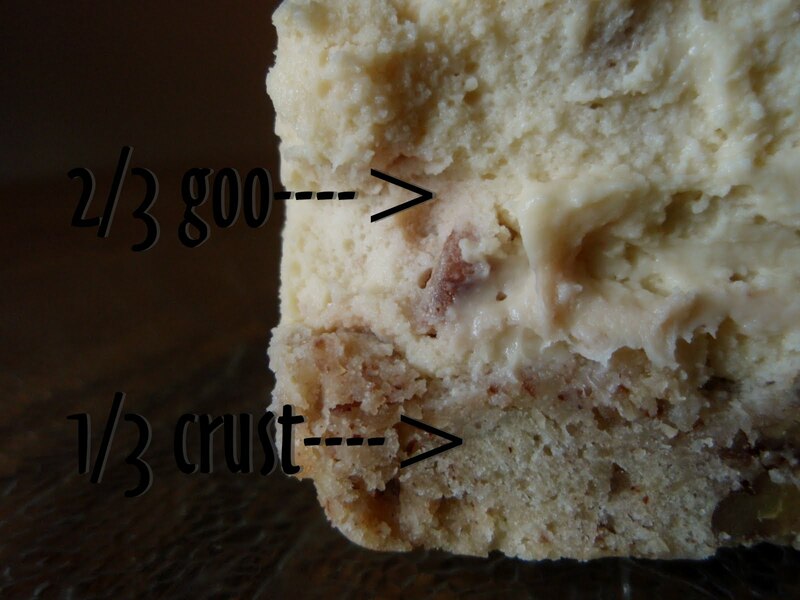 Although I might try to make this half crust, half cheesecake. Either way - awesome. When I saw the title of this post, I thought you meant proportions as in, serving sizes ;) Haha....love your proportions- definitely quite different to mine! :) Though I have to agree with you about the cheesecake- the base is my favourite! This cake looks really good!! I love caramel cheesecake! Oh my such a tempting desserts. Haha that is the THICKEST crust I've ever seen on a cheesecake -- I don't have a set idea of what the crust to cake proportions in cheesecake should be, so I'd definitely be open to this variation :). Chobani's a big fave in our house and it's rare that the fridge isn't stocked with it. :) Brilliant idea using it in a cheesecake! Your cheesecake looks lovely - I like the thick crust! My favorite cheese cake would be about 5% crust and 95% filling. I'm not a huge crust fan. I also don't really like frosting, so I frost cakes to suit the hungry horde, and have mine plain or not at all! We are total opposites. 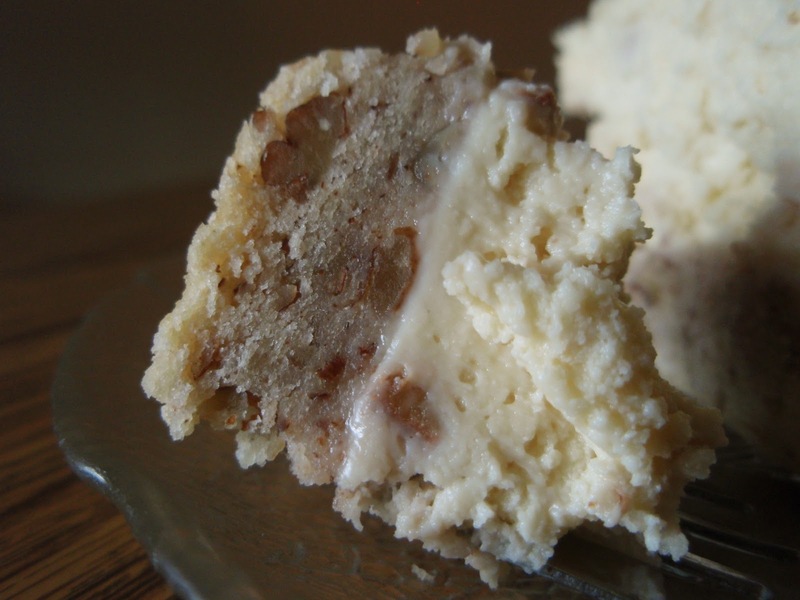 I love the cake more than frosting (unless it's coconut pecan then DOUBLE frosting please). I like the cookie more than the chocolate chips. I like the crust more than the filling. Funny how we all have our different tastes. This one has me drooling and it looks perfect exactly how you made it! Grace, I really don't care about the ratio...all the three layers look great, I'd dig into it without too much fuss. Love the idea of yogurt in it. That thick pecan crust does look like perfection. I haven't tried yogurt in a cheesecake before, but I'm going to have to now! I'm considering this as my pecan dessert for Thanksgiving. Can it be made a day ahead and still taste as fabulous as the pictures? And should I refrigerate overnight then bring to room temp?